Yeah, I've seen problems with Mint 64-bit because you have to install the 32-bit libraries in order to run 32-bit programs like Wine and 32-bit games. That is why I stuck with Mint 32-bit. Just easier in the long run. Do you know how to install the 32-bit libraries for Mint 64-bit? I lost my instructions, if you have them Boo, please repost so I can copy them to a safe place. May or may not help you. I honestly don't remember which wine I used to install B-2. I did initially follow Boomans Guide to get her up and running, But I update fairly constantly. What about your card drivers. I'm Using Nvidia which can update though "System updates/software sources/Additional drivers..."
I don't know if or how well this would work For an ATI card? Yeah. I'm not giving up on it yet. other than mic and the bright terrain until you go into it, I pretty much have it where I want it. No comments? Seriously? Battlefield 2 is a classic!!! OH MAN!! I REALLY need to get a linux but up and running. I can't get BF2 to run on my 7 box. I tried with the latest of wine and pol, but same issues. I have an amd/ati hd6450 card. I think some of the audio issue might be with that, because it has the hdmi audio. I have an old sound blaster 24 bit live sound card that I originally bought to play bf2 back in the day lol. It serves well for a cheap old card. I have sound but no mic, but my video is my biggest issue. I have been searching and finding different opinions about video driver. In your opinion, would I be better installing the proprietary drivers in additional drivers, or downloading from their site and installing? I posted a reply about hardware with a screenshot, but it won't appear till approved? Anyway I forgot to add I installed the 2 like it says in the guide. d3dx9 and dotnet11. After you install them there is no confirmation and no indication that they ARE installed. I installed mint 13 (mate de), due to it being LTS release. To no surprise, same deal. Here is the crazy part. Last night I figured I would install 13 (cinnamon) and try it. Totally different result. I ran the game, and the display was all screwed up, but it wanted to run. The best way I can describe it, picture taking one screen and split it into like 8 parts, then move them all around quickly lol. I would think that almost has to be a display driver or resolution issue. I had that issue with a few games. I tested Far Cry this weekend and that EXACT problem. All the terrain textures were white! Could be drivers with your card, but I don't have much experience with an AMD card in Linux. I have mostly read about bad experiences and driver problems. Check your Display options too. Always reboot Windows after changing these settings! Also, did you install the BF2 1.41 patch? Did you install the 1.5 patch too? If you tried it with a newer Wine, I have been told that it automatically includes "mono" which can conflict with dotnet packages. So you may have to install BF2 again. 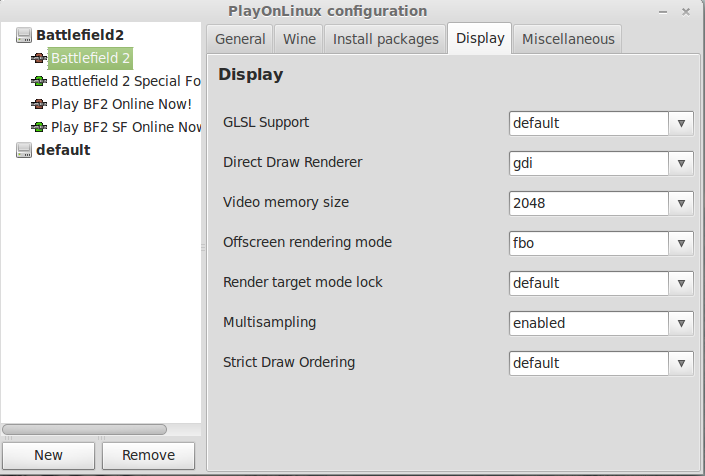 Ironically, BF2 probably isn't the best game to install for your first PlayOnLinux & Wine experience. It was probably one of the hardest games to get running decently. And... too many stinking steps. I did install both patches. Wouldn't it be possible to download, then install .net exe just like you would the patches? That way you would know its there. Yeah you can install pretty much anything, but what I've never understood about what runs in the background with Wine and Linux is how all of these packages work. You know... what if I installed ALL of the available packages? Does it even matter the order of when I install the packages? I'm sure there would be some major problems and conflicts. Wine users always recommend starting with a fresh prefix (virtual drive) when having problems... but thats usually my last step after doing all of my troubleshooting steps. I probably installed BF2 5 times before getting some success... hence why I am doing the tutorials... I don't want other people to endure that frustration. I would guess that there is something going on with your video card, directx and video drivers. But since I have no experience with AMD cards and Linux, it would be a good idea to do some research on your card. So let me get this Boo, after all this trouble what you saying is reboot into windows and just play the damn game? Last edited by chrisbard; 2nd April, 2013 at 09:13 AM. One of my pet-peeves with Windows is a required reboot after any hardware driver, Win update, or security software is installed. OSX and Linux do not have this problem. So with Wine, you have to simulate this "reboot" because the registry needs to be refreshed. Unfortunately it can cause problem if you install a windows package and don't reboot. But it is funny saying "reboot windows" in a Linux environment. Last edited by Daniel ~; 2nd April, 2013 at 07:43 PM. I don't remember every troubleshooting step from when I originally installed and ran Battlefield 2, but I must have selected "GDI" for a reason. In all my other tests "opengl" has the best results. So you are right Daniel, stick with "OpenGL"
I'll have to try BF2 again with Mint 14 and newer versions of Wine and PlayOnLinux too. believe me I believe you! LOL Been there way to many times myself. I tried, but not much different. I have been doing a lot of searching, and realizing what complete crap ati/amd cards are. From what I read, the linux drivers won't support the game. I now know I need an nvidia card. What would you guys recommend? I'd like about 1 gig memory, pci-e x16, and something that won't break the bank lol. Anything GeForce 8800 or higher will work great! I have been using a GeForce 550 Ti and it runs just about anything. I see a lot of different number GeForce GT cards? Basically something that would run bf2, bfbc2, and eventually bf3 on linux. What do you think of this? Last edited by crazyjust; 3rd April, 2013 at 02:13 AM.